Our professional group of certified IT consultants bring their experience and knowledge to each client of Edward Technology. The EdTech team is our research and development group. They test new technology and make sure that our recommendations meet stringent standards of care. Please contact us for any inquires you may have regarding our range of services. Edward Technology is a well-organized team of certified professionals, not just one guy who comes out when something breaks. We become an integral part of our customer's businesses so they can focus on what they do best. Most of our customers do not pay hourly for support. Our fixed pricing model (based on device count on network) allows the customer access to unlimited onsite and remote support. If you presently have an IT professional, you know one person cannot handle everything. Even if you only need help during emergencies, choosing Edward Technology as an IT partner saves time and money in the long run. With a diverse support staff who are knowledgeable about network design, installations, integration, security services, and more, you can call upon Edward Technology any time you are struggling with a technology problem. Creating a sharp, informative and fluidly modern website is imperative. Making a site affordable is also critical to your business. Let's collaborate to design your perfect online presence. 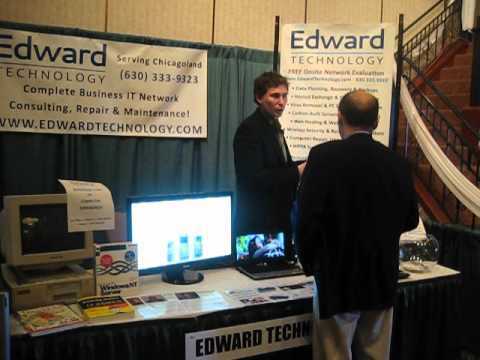 Edward Technology provides computer maintenance and IT support for our 35 employees in three states. Whether they are on-site or remote, they are always there when we need them. They were a great help when they moved us to Office 365. Everything transfered perfectly. We highly recommend Errol and Edward Technology! My company actually enjoys seeing Errol in our office. It always means something is wrong. Not Edward Technology. They are quick to respond, professional, and have a no-nonsense approach to network solutions. Their expertise and swiftness assure you will operate smoothly, at the same time, cost effectively. Edward Technology upgraded our entire computer network. Server, workstations, wireless, email, and all! Since we are located in Indiana, their no travel charge helps keep our IT budget low. Thank you guys for all of your continuing support.